TwoMorrows’ new Color Catalog is back from the printer! It lists ALL available items, plus upcoming sneak peeks! A copy will be included with every new order we ship, or you can request your FREE COPY here! 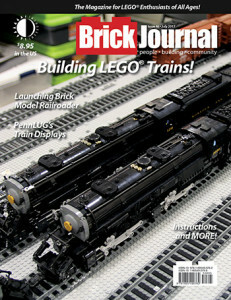 And BrickJournal #46 ships today, featuring LEGO® train builders! This entry was posted in TNT on 28 June 2017 by Mr. Morrow. See private files of Golden/Silver Age comics writer OTTO BINDER! Few comics writers wrote more stories—or more important ones, with major heroes—than Golden/Silver Age star Otto Binder. 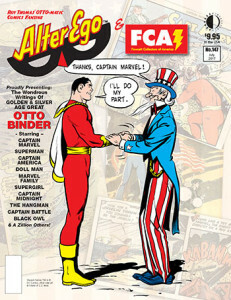 For the first time, Alter Ego #147 (shipping today) features a giant-size FCA [Fawcett Collectors of America] section, with special intros by P.C. Hamerlinck and Bill Schelly—and Binder’s own personal script records, accompanied by illos from his greatest series, including Captain Marvel, Superman, The Marvel Family, Captain America, Mary Marvel, Black Owl, Captain Marvel Jr., Doll Man, Supergirl, Captain Battle, Legion of Super-Heroes, Captain Midnight, and a zillion more! With art by Beck, Simon & Kirby, Swan, Schaffenberger, Avison, Boring, [Jack] Binder, Mooney, Plastino, Pfeufer, Shores, and the super-stars of two comics eras! Plus Michael T. Gilbert in Mr. Monster’s Comic Crypt, et al.! With a cover of previously unpublished Captain Marvel art by C.C. Beck! It’s edited by Roy Thomas. This entry was posted in TNT on 26 June 2017 by Mr. Morrow. TwoMorrows at Heroes Con this weekend! This entry was posted in TNT on 16 June 2017 by Mr. Morrow. Preview TwoMorrows’ new Reed Crandall book now! Ships July 19! Roger Hill’s exhaustive bio of the famed artist of Doll Man, Blackhawk, and the Ray is the perfect compliment to IDW’s new Artist Edition of Crandall’s amazing EC Comics work! 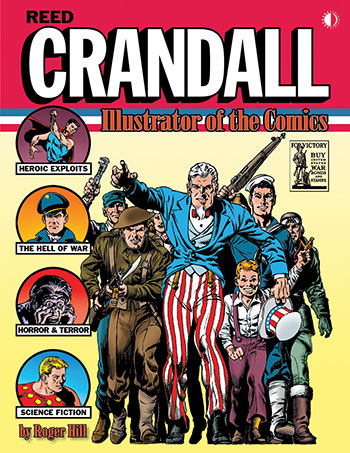 From the 1940s to the ’70s, Reed Crandall brought a unique and masterful style to everything he touched, including Doll Man, The Ray, and Blackhawk (his signature character); horror and sci-fi for EC Comics; Warren’s Creepy, Eerie, and Blazing Combat; the THUNDER Agents and Edgar Rice Burroughs characters; and even Flash Gordon for King Features. This full-color hardcover includes never-before-seen photos, a wealth of rare and unpublished artwork, and over eighty thousand words of insight into one of the true illustrators of the comics. Don’t miss it! This entry was posted in TNT on 9 June 2017 by Mr. Morrow. Mega-Mag Sale! 50% off magazines! Word or warning: Many of our last year’s mags are close to selling out (several already have), but those newer ones are still available at 15% off. So scoop ’em up before they’re gone! 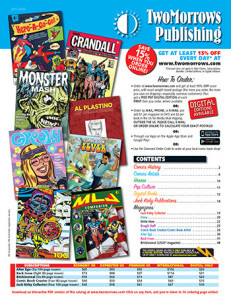 This sale does NOT include recent, new, or upcoming issues, or digital editions. But some of these print issues are actually CHEAPER than the separate digital edition, and have the digital edition is included FREE. And only ONLINE orders are eligible for these sale prices. This entry was posted in TNT on 5 June 2017 by Mr. Morrow.